An important, yet often under-discussed factor that affects urban planning outcomes is the process through which planning decisions are made. The process reflects both the incentives guiding policymakers and the relative power of those policymakers at various levels of government. As such, the structure of Cairo’s local governance systems matters when discussing urban planning and decision making. Given the changes taking place in the country right now, with the possibility of restructuring government institutions, recognizing how existing governance structures worked and impacted urban growth is important. One prominent feature of Egypt’s governance structure under the pre-January 25 regime was its strong centralization. In a great cross-disciplinary edited volume discussing modern Cairo’s governance and urban space, Cairo Contested (edited by Diane Singerman), academic and researcher Sarah Ben Nefissa points out that Cairo suffered from a very weak administrative system, due to “excessive centralization, lack of transparency, and communication failures between the administrative apparatus and citizens”. The Egyptian government kept power centralized, granting very little political power to local governments. 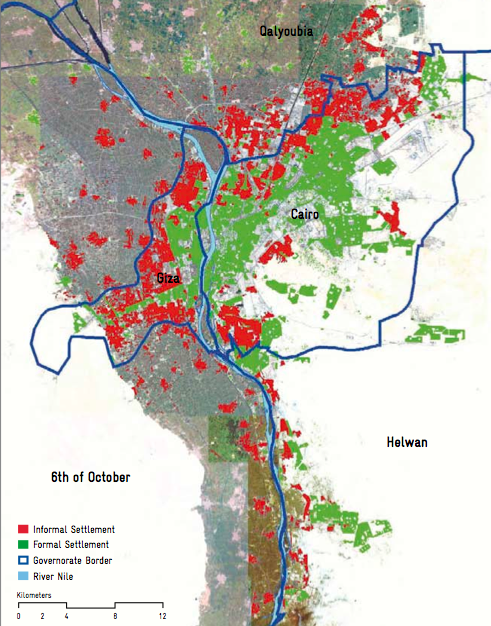 Greater Cairo’s separation into multiple political-administrative units, falling under multiple governorates, also made coordination in planning extremely difficult. District-level governance has ‘Local Popular Councils’ (LPCs – elected through local elections) and Council of Local Civil Servants (CLCS – appointed by district president). At the local level, there are overlapping administrative bodies, with each office having different sources of authority (the LPC, CLCS, and governor) creating further confusion. The elected LPC councilors have little authority as they once did during Anwar Sadat’s era, and have little say in budgeting and thus policy-planning. Therefore essentially, the civil servants and governors ran the districts. Power was extremely centralized in the governor’s hand, creating an “extremely inefficient system, corruption, and waste or theft of state funds”. This structure then has implications for service delivery and urban planning. Since the central government controlled where the money went (governorates got 70% of their funding from there), they were able to decide which policies were followed. Decision-making about policy and resource-allocation was very top-down, and did not need to involve local communities. People had little say in how their money was spent in their neighbourhoods. So, if the central government preferred a flyover to the satellite towns in a densely-populated area over a road-widening project or more public transit options, it is clear which project would get the money and be completed. “The organizations are there, the regulations are there, but the official, final decision-making process just doesn’t follow the logic,” states Khaled Abdel Halim, the United Nations Development Programme’s (UNDP) technical advisor to the Local Development Ministry. Additionally, according to David Sims, an urban development specialist with 30 years of experience in the developing world who authored “Understanding Cairo: The Logic of a City Out of Control,” Cairo’s urban planning infrastructure also suffers from a lack of inter-agency coordination and an overly centralized authority on minor matters that require senior officials’ approval for a decision as simple as fixing a street light. As a result, delivery to working-class areas was extremely poor and contributed to feelings of political marginalization. Unlike more well-off segments of the population, the working class cannot pay for these services themselves. They require local government to provide them access to water, electricity, sewers, etc and more importantly, they require the ability to meaningfully participate in their local government. This requires empowering the the governance institutions closest to the people. As Cairenes and Egyptians now contemplate what their new regime should look like, issues such as decentralization (political, administrative, and fiscal), the power and structure of local district governments, and incentives for decision-makers also need to be thought of in the context of their impact on urban planning. Keep an eye on Venezuela. South american country using described urban destruction tecniques to achieve a totalitarian regime. Is this post also in Arabic?